When working with hospice I often had people tell me, “Oh, I could never do that,” and I was never quite sure how to answer them. Because while on the one hand I could see they were sincere, on the other I knew they were wrong. Of course they could help care for someone who’s dying. Bathing and toileting are not rocket science. A more compelling reason is the fact that compassion, empathy, and the desire to alleviate each other’s suffering is an essential part of human nature. Sure, you don’t think you can, you don’t want to, you’re scared of it, and you may even feel nauseous at the thought. But then in the blink of an eye…boom…it’s your loved one who’s lying there so achingly vulnerable and suddenly, not only can you do it, you find doing it totally transforms you. Never underestimate the power of your own heart. Here’s a great example of a lot of people discovering over the course of a single day that dying is simply no barrier to loving and caring. A pod of twenty-two pilot whales beached themselves yesterday along the south Florida coastline and, except for five babies young enough to transport and rehabilitate, the rest wound up dying there. “TCPalm.com reports that hundreds of residents came to the beach to assist with the rescue, helping the animals turn upright so they could breathe better. 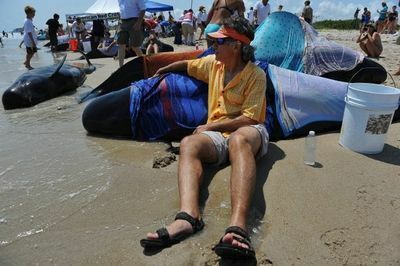 Volunteers covered the whales with moist towels and poured water over them. Red Cross volunteers helped ensure that volunteers stayed hydrated in the hot sun. I’m willing to bet that, if they’d been asked beforehand, most of the people on the beach that day would have also claimed that working with hospice was something they could never do. And yet there they were anyway, tending to a pod of strangers whom they knew full well were dying and yet couldn’t bear to leave to do it alone. Of course we can all do that kind of work. In fact sometimes, it can be a lot harder not to. Loved this story of compassion in action.